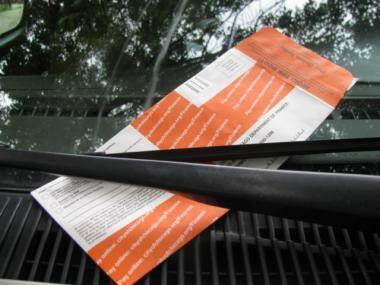 One of the approximately 2.4 million Chicago bright orange parking tickets issued every year. CHICAGO — Mayor Rahm Emanuel has always taken a hard line on recovering money owed to the city — particularly when it comes to parking ticket scofflaws and those who rack up red-light or speed camera tickets. But that tough stance hasn't translated into efficient ticket debt collection. The amount of unpaid tickets and fines has grown to a staggering $1.5 billion on Emanuel's watch, according to data obtained through a Freedom of Information Act request by DNAinfo Chicago. The debt accrues at a pace of $1 million a week, documents show, far more than what the city collects on those tickets weekly. The bulk of the debt, $1.3 billion, is unpaid parking tickets, a total that has increased by $177 million, or 15 percent, since Emanuel took office in May 2011. Meanwhile, unpaid red-light camera tickets and fees hit nearly $205 million, while unpaid speed camera fines reached $27 million by the end of 2014, after the first two years of the program. The enormous amount in unpaid parking and camera tickets surpasses the combined ticket debt owed to both New York City and Los Angeles — even though both cities are far larger and write more tickets annually. One way the city has attempted to improve the amount of debt collected — setting up payment plans — has largely failed, city data shows. More than four times as many plans are in default compared to the number that are in good standing — meaning most of those plans haven't prompted more people to pay their bills. "Geez, unbelievable," said Louis Schimmel Jr., a municipal finance expert with the Michigan-based Mackinac Center for Public Policy, when told the magnitude of Chicago's ticket debt. "The problem could be two things: the collection process or there's a need to shore up the enforcement," he explained. "If people are able to get by without paying [ticket debt], they ask 'Why should I pay?' It's got to be changed." Ald. Scott Waguespack (32nd) sees Chicago's huge ticket debt as a major problem for a city desperately in need of revenue. He said Emanuel hasn't done enough to recover the city's money. "Based on their proclamations several years ago, they have not come through at all in terms of collections,'' said Waguespack, a frequent critic of the mayor. Late Tuesday morning, Emanuel spokeswoman Susan Hofer said the city was doing all it could to collect the debt — 70 percent of which was generated before the mayor took office. "It is debt that stretches back a quarter of a century to before the fall of the Berlin Wall. Many of those who owe money from two decades ago are deceased, have moved, or are otherwise unreachable," she said in an email. "We work diligently to ensure that those who owe fines and penalties pay them while working with people who want to comply with the law but need assistance, including helping them enroll in payment plans," she said. She said the Local Debt Recovery Act (see below) had "increased the collection of debt five years and older by 86 percent." Officials are also considering other measures to increase debt collection. While Chicago issues an average of 2.4 million parking tickets annually, Los Angeles issues even more: 2.5 million. Meanwhile, New York every year issues a combined total of 10 million parking, red-light and speed camera tickets on average — 2½ times Chicago's total for the same three categories. But scofflaws owe New York only $756 million, according to data from the city's Department of Finance. And Los Angeles, which doesn't have red-light or speed cameras, is owed $285 million, according to the Los Angeles Department of Transportation. One reason the outstanding debts are lower is because both cities have a statute of limitations on collecting the debt: eight years in New York and five in L.A. Chicago, meanwhile, collects debt that dates to 1990. But Chicago's debt surpasses both cities by tens of millions of dollars or even more when comparing those same time frames. Waguespack said the city should look to how those cities get scofflaws to pay their debt. One advantage L.A. has is a state law that allows the California Department of Motor Vehicles to collect unpaid parking ticket fines when motorists register their vehicles every year. "You can't renew your vehicle registration without paying outstanding tickets," said L.A. Transportation spokeswoman Tina Backstrom. New York employs a more traditional carrot and stick approach. First the carrot: New York has a more gradual increase in late penalties than Chicago. While fines for an unpaid parking ticket here double after 42 days, New York adds late fees incrementally, said the city's Department of Finance spokeswoman Sonia Alleyne. Fees start at $10 after 30 days and top out at $60 after 60 days. But the stick comes more swiftly in the form of a boot — which can be applied as soon as 100 days from when a ticket is issued if more than $350 is owed. In Chicago, two or three unpaid tickets, depending on the circumstances, are required for a driver to become boot-eligible, and even then the boot could be delayed another 12 months. Mary Gotsopoulis, chief administrative law judge for New York City, said she believes the swift boot is the main reason motorists in in her city pay up so quickly. "The fact that $350 worth of tickets in judgment can get you booted plays an important role in that," said Gotsopoulis. "Part of the fear is you don't want your car booted. That $350 threshold is proactive collection — you're always keeping that in mind." The end result is New York is amazingly good at getting debts paid: 89 percent of tickets are paid within one year of issuance, officials said. It's unclear what percentage of tickets are paid in Chicago. In 2012, the Emanuel administration, with former city comptroller Amer Ahmad at the helm of the Department of Finance, made some changes to try to collect more unpaid ticket revenue. The first thing was implementing the Local Debt Recovery Act, state legislation pushed by Emanuel to allow cities and towns to grab the state income tax refunds of people who owed money for tickets, water bills and other debts. This has allowed the city to wring nearly $39 million in old ticket debt in the last three years from vehicle owners living in Illinois. While praising that effort, Waguespack thinks the city could improve collection of ticket revenue by lowering fines and penalties and assessing late fees incrementally instead of doubling fines. That would make it easier for some motorists to pay the bills and encourage them to do it more quickly, he said. Waguespack also said the city should institute a statute of limitations on tickets. This would allow vehicle owners to access bank records to prove a past due ticket was actually paid. "We would need to look at changing policy, including an amnesty, instituting a statute of limitations, lowering penalties for late payment and potentially lowering fines," Waguespack said. "If you lowered the fines and enforced [more], you'd be bringing in more revenue and we wouldn't be in a situation with billions of dollars in outstanding debt." Those changes would require changes in city code, other changes — such as collecting before allowing new vehicle registration — would require a change in state law. The other change Emanuel and Ahmad made at the Department of Finance was making it easier for motorists to establish payment plans to pay off ticket debt. They dropped the $500 minimum debt to qualify and established payment plans for people experiencing economic hardship by lowering the initial down payment and doubling the length of time to pay off the debt. "As I have said from the beginning, we are going to be more effective in collecting debt owed to the city because it is unfair that those who play be the rules and pay their debts are left holding the bag for those who do not," Emanuel said when announcing the plan. But while motorists quickly took advantage of the more liberal terms, the number of new payment plans peaked at nearly 94,000 in 2013. The number of payment plans has since dropped by 40 percent, to 58,000 last year. Even more problematic is the number of those plans that fail. Of the plans on the books, nearly 285,000 are in default, according to city data. That's more than four times as many as the number that are in good standing, nearly 65,000. The plans in default total nearly $211 million, or 14 percent of the total debt owed the city. The plans in good standing totaled $38 million at the end of 2014. "That says it all — there's no enforcement, there's no incentive to pay their ticket debt," Schimmel said. The city's Hofer said the mayor was looking to fix the program, although she did not give details. "The administration has been working for months on an improvement to the current payment plan system that will soon be advanced in the City Council," she said in a written statement.